The largest animal that has ever lived! There are two subspecies of Blue Whale in the Southern Hemisphere, the Antarctic (Balaenoptera musculus intermedia) and the Pygmy (Balaenoptera musculus brevicauda). New-born calves 6 to 7 metres. Pygmy Blue Whales over 24 metres. Antarctic Blue Whales can reach over 30 metres in length. Birth weight is about 1 to 2 tonnes. Pygmy Blue Whales up to an estimated 150 tonnes. Antarctic Blue Whales can reach 200 tonnes in weight. Blue Whales breed every 2-3 years. Gestation lasts 10-11 months. They reach sexual maturity at around 10 years of age and physical maturity (maximum length) somewhat later. A nursing Blue Whale cow can produce 200 litres of milk per day. The milk has a very high fat content of 35-50% allowing the calf to gain weight rapidly. Calves are weaned at seven months, when they are 16m long. Blue whales almost always feed on krill. A Blue Whale can consume over 3000kg of Krill per day. Blue Whale are baleen whales of the rorqual family Balaenopteridae, which have grooved throat pleats enabling expansion of the throat pouch during feeding. They feed by driving into a krill swarm, and gulping a huge mouthful of water and krill, which often actively attempt to avoid being eaten. The whales then push the water out of their mouths using their tongues and by muscular contraction of their distended throat pouch. Their upper jaws contain baleen plates which filter out the food, which can then be swallowed. When viewed from an aircraft a feeding Blue Whale with a mouth full of water and prey has been described as looking like a giant tadpole! The blue whales have been called the Greyhounds of sea because of their sleek lines and speed. Blue Whales are generally light to dark grey in colour with distinctive mottled patterns on their flanks. These patterns are unique to each individual, enabling individuals to be photo-identified and subsequently recognised. Seen through water, the skin colour of blue whales mysteriously appears an almost iridescent glowing blue, hence their name. They have long slender bodies, as do their smaller cousins fin and sei whales. Their heads are flat and distinctly U shaped, with a prominent ridge running down the middle from the blowhole to the top of the upper lip. The Blue Whale has a lung capacity of 5,000 litres and produces a spectacular blow through its twin blowholes that can exceed 15 metres in height in calm conditions. The pectoral fins are 3 to 4 metres in length. The dorsal fin is a small variably-shaped fin located about three quarters along the body and is usually only seen when the whale dives. Blue Whales are fast! They can reach speeds of over 35 kilometres per hour over short bursts and can cruise at 20 kilometres per hour though they usually travel much slower. When searching for food they might slow to 5 kilometres per hour. Very high blow up to fifteen metres in height thought usually considerably less. Light to dark grey in colour with distinctive mottled flank patterns. Broad flat U shaped head with prominent splash guard in front of the blow holes. Small dorsal fin well back. Can lift their tail clear of the water when diving unlike Fin Whales. Usually alone or in pairs. The Blue Whale is phenomenal in the water! It can travel extraordinary distances, reach impressive speeds and dive to 500m when feeding. Not bad for the largest animal that’s ever lived. Blue Whales are found worldwide. They gather to feed in areas where there is abundant food that can support such large animals. In summer feeding areas they are usually seen singly or in pairs, though larger numbers aggregate when food is abundant. It is thought that their winter breeding grounds, still largely unknown, are probably also rich in food, as blue whales lack the thick blubber coats seen in species such as humpback and southern right whales, which fast during their winter migration. In the warmer summer months Antarctic blue whales migrate to Antarctic waters to feed, then return to the warm tropical to equatorial waters during the winter to breed. Pygmy blue whales in the Australian region gather in summer feeding grounds off the coasts of southern Western Australia, south-east South Australia, and western Victoria in productive upwelling regions. They also migrate to warm tropical or equatorial waters to breed in winter. Populations in the Northern Hemisphere don’t appear to mix with those in the Southern Hemisphere. Although feeding often occurs at the surface, Blue Whales typically dive to less than 100 metres, although feeding dives to 500 metres have been recorded. Whales achieve these remarkable depths by making powerful swimming strokes as they leave the surface then relaxing into a glide for the rest of the descent. They are able to reduce their oxygen consumption and have lungs that are designed to collapse as the pressure increases, when they then rely on oxygen bound up in blood and muscle. The increased pressure compresses their body and forces the air in their lungs into a smaller volume making them less buoyant and in turn aiding the dive. for his generous advice and guidance in creating this page. Dr Peter Gill studies the largest animals that have ever lived – the Blue Whale. Here Peter shares how he became involved in this study and some of the amazing things he’s learnt about them. 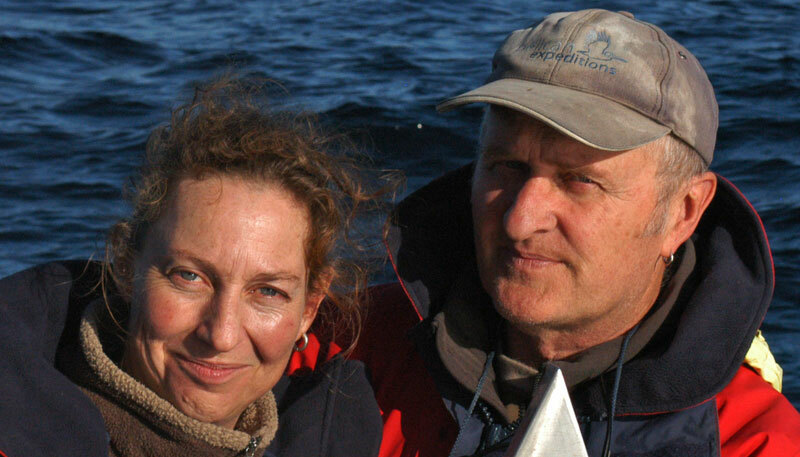 Peter Gill first became involved in humpback whale research on the NSW coast in 1983. This led to research using small sailing vessels to follow humpback whale migrations into tropical and Antarctic waters. In the late 1990s he came across a survey report describing the sighting of an unusual number of blue whales near Portland, Victoria. At this time blue whales were rarely sighted around the Australian coast. Sailing there with a group of friends in early 1998 he found blue whales feeding there. He also learnt about the Bonney Upwelling, a unique oceanographic phenomenon which brings massive amounts of nutrients onto the continental shelf off western Victoria and south-east South Australia, feeding abundant krill which in turn are food for blue whales and a diversity of other marine fauna. Peter moved to western Victoria in 2000 and has since lived near Portland, the home port for the Blue Whale Study and its ecological research into blue whales and the Bonney Upwelling. He shares this work with his colleagues Margie Morrice and Rebecca Pirzl. For a humungously large animal, they can move extremely fast. For a humungously large animal, they can quietly disappear without a trace. When they are seen through water, their grey skin appears a luminous blue. When they gulp their food (krill) mixed with seawater, their throat balloons out to hold up to 100 tonnes of water and from the air they look like an enormous ‘blue tadpole’. Somehow they can find small scattered patches of krill in water so murky they can’t see their own body length ahead. They can accurately navigate across thousands of km of ocean during migration.